Sorry. Like I already mentioned in my replies to the comments, I couldn’t take photos of the tea ceremony last weekend. 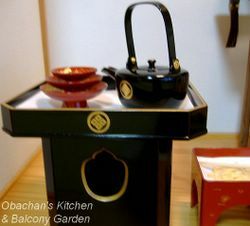 You might wonder how tea ceremony was related to the sightseeing in Muroto. It’s not that the traditional performance is especially popular in this area. But tea ceremony was something nice to add cultural and traditional touch to the event, I guess, and more than anything, it can use the leading product of the area – “deep sea water.” Yes, my mom and her students used deep sea water (desalted) for making matcha. I’ll talk about how it affected the taste of the tea later. Anyway, these are the food photos I managed to take before we started setting up our booth. After that, I didn’t have a chance to take out my camera. 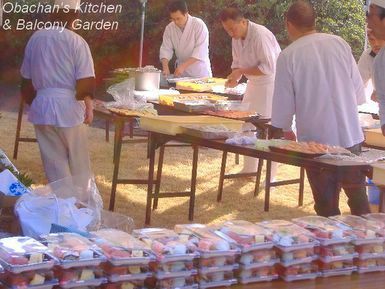 This was the booth by local chefs and they made and sold nigiri-zushi bento there. They started working earlier than any other booths. At our booth, we spread white cloth over the foldable tables and set 10 foldable chairs. My mom and her students made tea in one corner which was hidden from visitors by red-and-white backdrops. Three RELATIVELY young women (incl. myself) in kimono received tickets from visitors and told tea-makers the number, then brought matcha and wagashi to the tables. The funny thing was that most of the wagashi was rice cakes with anko inside, and the rice cake part was so moist and sticky that the guests couldn’t cut it easily with a wooden pick. Most of the local people don’t really care about the manner of tea ceremony, but since women in kimono brought tea and took a bow as serving it, they seemed to have thought that they had to behave elegantly, too. So all of them tried to cut the wagashi nicely instead of stabbing it with the wooden pick and biting it off. It was hilarious to see them – even big old guys – trying so hard to cut the small rice cakes. The most amazing thing was that there were three or four kids who really loved the matcha and asked for seconds, or thirds. One of them even came to the “backstage area” to say thank you to my mom and her students. I guess those of you readers who have tried matcha know how bitter it is. Even though we made weaker matcha for kids, it was totally amazing that kids loved it so much. The secret was the deep sea water. I don’t know why, but when you use deep sea water for cooking or making drinks, it always makes the taste a lot milder. Maybe because of its rich mineral content?? So, some think it ruins the real taste and flavor of tea or coffee, but some do like it. Well, helping the event was kind of fun, after all, but I don’t know if I want to do this again in the future. Please help me with English. What's the difference between "desalted seawater" and "desalinated seawater?" The former had 217 hits and the latter had 9,540 hits with google, so the latter seems to be more popular, but is this a grammer thing or is there a difference in their production process or something? Having a late night supper now after my izakaya work. Nabeyaki-udon, inspired by Amy’s recent post. The fridge was delivered this morning. No more freezer defrosting in my life. Yay!! 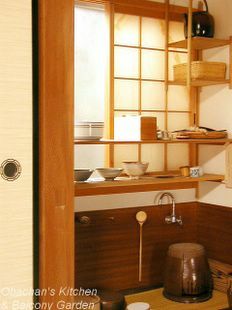 :D What I have now is a new fridge, clean kitchen, warm udon and sake on my kotatsu. And I’m watching Dae Jang Geum videotaped tonight. No work tomorrow. NO, not finished yet. But I had some leftover heavy cream from the caramel butter cake I made the other day. Now that my old fridge has been unplugged, I wasn’t sure if the cream would be OK without being refrigerated. So I took a break from cleaning and googled a little while to find a cake recipe that calls for heavy cream. 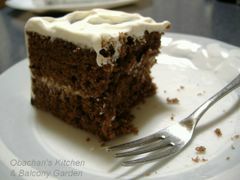 And I finally found this Mississippi Mud Cake recipe. 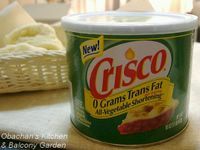 Since I baked a butter cake just the other day, I wanted to stay away from butter this time, so I went for the Crisco. I had no chocolate for frosting, so I whipped the remaining heavy cream after the batter was put into the oven. 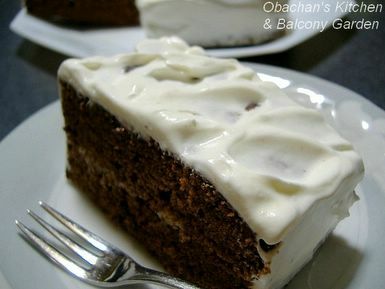 And I needed to use up one more thing: frozen cream cheese frosting that had been thawed since the fridge was unplugged. I decided to slice the cake in half and sandwich the cream cheese with the slices. The result? 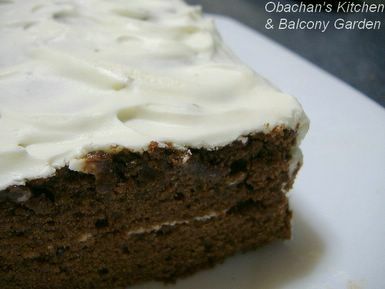 Well, I’ve never tried adding coffee to chocolate cake batter before and I was a bit skeptical, but the cake turned out great—at least, tastewise. (I didn’t do a good job mixing in the dry ingredients as you can see in the photo.) Yes, I like the taste. To me this seems to be a keeper... This is rather dangerous kind of cake for me, though. It is sweet but not heavily sweet, and I end up eating too much at one time. Is this something universal? Does this happen to you, too? I mean, when home electronic products break down, they break down one after another, don’t they? Isn’t this Murphy's Law? Or does this happen only to me? Anyway, I finally bought a new refrigerator today and it’s going to be delivered on Friday morning. Before I decided on which one to buy, I shopped around all afternoon till I was totally exhausted. What made me mad was that for having the fridge delivered, I had to pay extra 2000 yen, and what was worse, they charged me for another 5,355 yen for throwing away my old fridge that broke down. ※＃●Ｘ !!! ** OK, sorry, I was wrong. The 5,355 yen was for the cost of recycling, not the cost for them to throw away the old appliance. Now I need to empty the fridge I have now and clean the kitchen by Friday. Hence, this supper tonight. 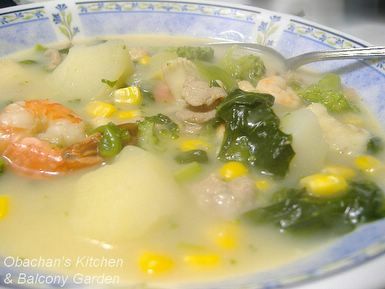 Maybe I should call it “chowder.” The quickest way to use frozen spinach, broccoli, corn, seafood mix, pork and chicken stock that were in the freezer. The taste? Edible, at least. OK, let’s see the bright side of it. On this coming Friday, I’ll have a new, slightly bigger fridge with a self-defrosting freezer AND clean kitchen! For that kind of joy, I should be happy to go through the hardship of cleaning my old fridge AND the kitchen. Oh, I hope I don't have to buy a new lanudry machine anytime soon! Lucas of Cooking In Japan tagged me for the Too Much Information meme, and looks like I’m supposed to post 10 random and interesting (and maybe weird) facts about myself and tag 5 people. OK, here’s 10 random facts, but I’m not sure if these are interesting to anyone. 1. I have practiced Aikido, Kyokushin Karate and Kung fu when I was young. Not all at one time, of course. My Aikido and Karate are all rusty now, but I still practice some Kung fu moves just to stay fit. 3. I can play Japanese traditional instrument called Koto a little. I’m not very good, but I think I can still play a piece called “Roku-dan,” if I practice it several times. 4. I think I enjoy karaoke but only with friends who like the same kind of songs as I do. 5. In addition to the well-known cedar pollen, I’m allergic to some perfumes. 7. I haven’t been to a movie theater for about 8 years… or could be… 10 years! 8. When I was working as an "office lady" in Osaka, I used to go dancing at Studebakers in Umeda about once a month. 10. I’ve been hooked on a Korean drama, Changumu no chikai (Dae Jang Geum,대장금, 大長今). It’s a Korean dynasty drama and the heroine, changumu is a talented young woman working in the kitchen of the imperial court. It’s her success story, with lots of interesting information about Korean foods, and I heard that she becomes the king’s doctor eventually. Anyway, today I tried something I wanted to try since I read this entry on "she who eats." And I couldn’t resist the temptation to turn it into a caramel marble cake after I saw this site. 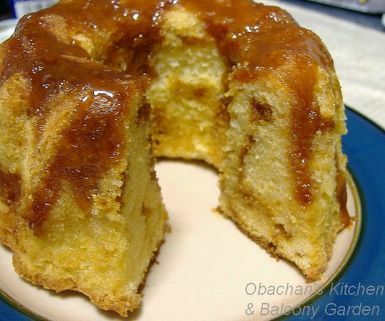 Since my kugelhof pan is a small one, I reduced the amount of ingredients of this recipe (in Japanese) to 2/3, and added a couple teaspoonful milk to the batter because it looked a bit too thick without the caramel blended in. I thought everything went pretty OK. The batter didn’t flood like the time I made a cherry pound cake for Christmas, and the caramel was browned but not burned, leaving only a slight bitterness. Just one thing… again, the side didn’t turn brown. What am I doing wrong? I buttered and floured the pan, but would it make a difference if I use oil instead of butter next time? (I can't get a non-stick spray here.) 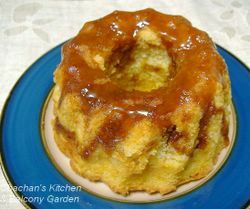 How can I bake a caramel butter cake like this? Should I set the oven temperature higher?? Mmm…. Need more practice, I guess. I felt like something spicy and prawns from Vietnam were on sale at the supermarket today, so I went for this Chinese dish using a ready-made sauce (retort pouch stuff) again. 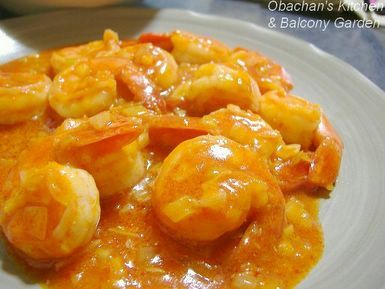 Tell me, what’s the most popular English name for this dish? 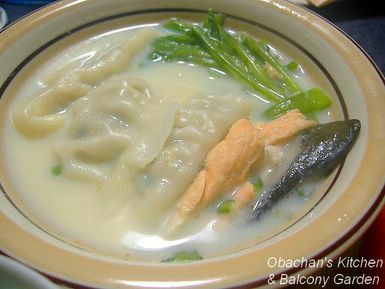 Another dish for tonight: “Trying-to-make-some-room-in-the-freezer soy milk soup.” Ingredients were: frozen salmon scrap from the bouillabaisse night, frozen gyoza dumplings from…I don’t remember when, leftover shungiku (garland chrysanthemum?) and very-close-to-the-expiration-date soy milk. My boss at theIzakaya called me this afternoon and told me not to come to work tonight, so I’m enjoying an unexpected free time right now. Yay! Maybe I’ll bake something tomorrow. I went to see a traditional bow-shooting festival in a town called Yasu last Sunday. It was about noon when the festival was finished, and I bought one pack of takoyaki to eat in the beachside park called Ya-shii Park. 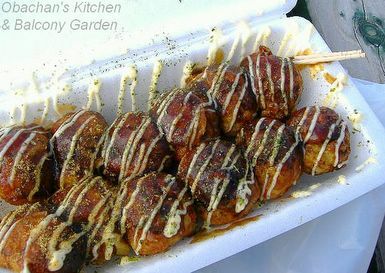 The guy at the takoyaki stall was very nice. He gave me 2 extras because those takoyaki were rather dry from being left in the pan for quite a while. These were the treat at the festival called Momote-sai. 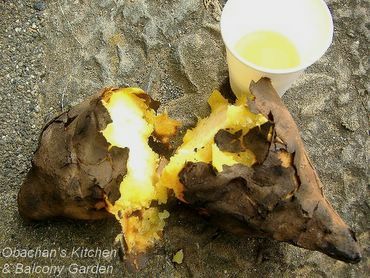 You can see how big the sweet potato was in comparison with the paper cup (180 mL cup, I guess). 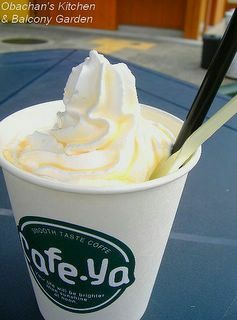 This is the coffee drink I had at “Café-Ya” near JR Yasu station while waiting for the train. The cream was so sweet, but it was a good contrast with the bitter coffee. I know. I know. The vol. 1 of the “Project Mochi” series was posted LONG time ago -- actually a year ago -- on this blog. Now here’s finally "vol.2" after one year of silence! ;P I’m determined to try out a couple more recipes this month, so stay tuned. I almost accidentally found this recipe on the net yesterday. Wrapped in spring-roll wrappers are shiso, thinly sliced mochi (rice cake), karashi mentaiko and sliced cheese. Absolutely no seasoning necessary. 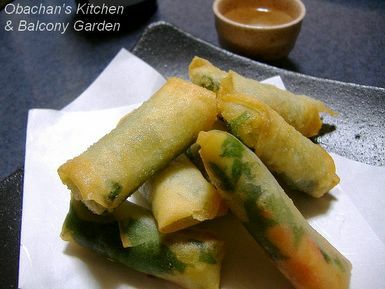 Just roll them up, seal and deep-fry. I used store-bought mochi made from glutinous rice (not the ones made from rice flour). 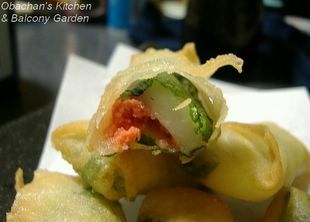 The spring-roll wrappers seemed a little too big, so I cut them into quarters and made mini-rolls. Leaf vegetables are expensive now. One cabbage costs something like US$4 at supermarkets around here, and the price of lettuce is said to be doubled in many places. It’s because of the cold wave and the heavy snowfall in the northern part of Japan this winter. 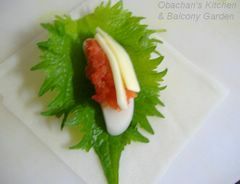 At our izakaya, we see less and less green veggies used for makanai (employees’ meal) these days. With our carbohydrate-rich meal in front of us, we joke that leafy veggies are poisonous and bad for health, and that’s why we shouldn’t use them for our own meals. Some nights are just so slow that we have nothing to do but to indulge in cynical jokes. … I hope the snow in the north stops soon. 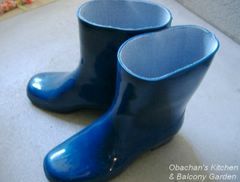 * The rubber boots in the photo are what I wear in the izakaya kitchen. This was my breakfast on a lazy morning in the second week of the month. 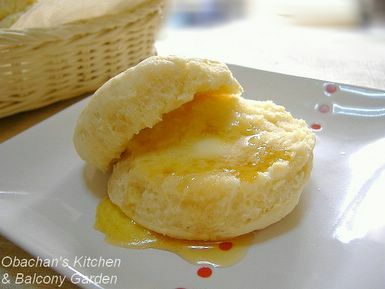 I made yogurt biscuits with the trans-fat free shortening I mentioned in my blog before. (Yeah, I ordered a couple when I mentioned about it in my post at the end of last year.) I used this recipe, but added just a little bit of sugar. 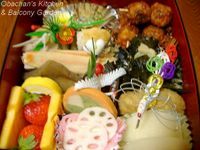 In Japan, happy occasions are often celebrated with wagashi, and New Year’s holidays are no exception. At this time of the year, almost all Japanese confectionery shops sell wagashi that represent themes related to New Year’s celebration. They are often in the shape of the zodiac animal of the year, or animals/plants associated with good luck, such as crane, turtle, bamboo, pine and plum. Wakatake (young bamboo) is associated with good health, strength and endurance because it grows fast and remains green all year round. 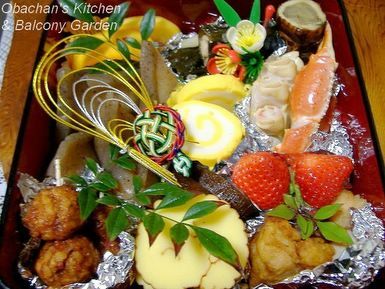 Gold leaf is often used for New Year’s wagashi to add a festive touch. 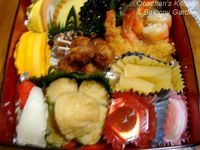 Hanabira mochi is a traditional New Year’s wagashi with a long history. Its origin is a dessert called “hishi hanabira” which has been part of the traditional New Year’s dishes at shrines and the Imperial Court for hundreds of years. In olden days, they had a custom of eating certain chewy foods as part of their New Year’s ritual of wishing a long life. (The idea of “keeping good teeth” was associated with “living long"). 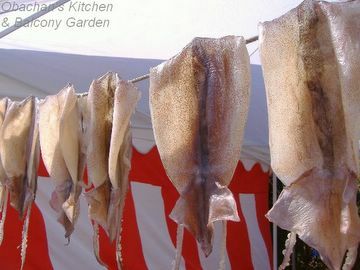 Included in the chewy foods was oshi-ayu (sweetfish with its head and tail cut off). Eventually the ritual was simplified and they started eating special rice cakes called hishi hanabira instead of the original ritual foods. 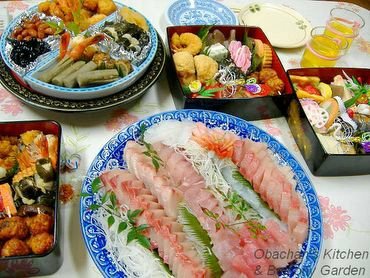 It is said that the sweetened burdock strip rolled in the hishi hanabira rice cake is the substitute for the oshi-ayu, and the miso added to the sweet bean paste also rolled in the rice cake is associated with zoni soup, another traditional New Year's dish. 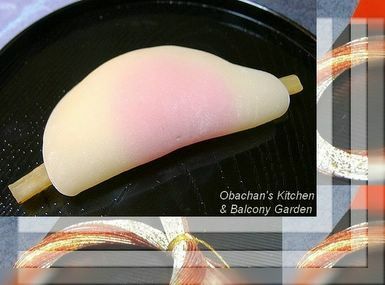 This site has a hanabira mochi recipe with a photo showing inside of this elegant wagashi. (Scroll down and click to enlarge the photo.) 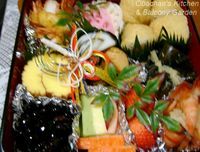 Yes, the name “hishi (diamond shape) hanabira (flower petal)” came from the diamond-shaped pink rice cake inside. 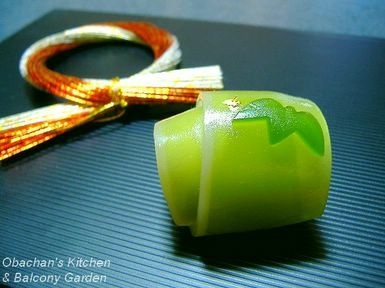 This wagashi has been used at the first tea ceremony of the year by urasenke school of tea ceremony since they got a permission from the Imperial Court about 100 years ago. 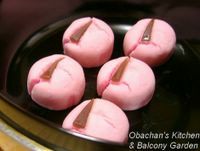 Recently hanabira mochi has become popular among those who do not practice tea ceremony, too. Comments and corrections are welcomed. You might expect traditional customs to be better observed in rural areas while gradually dying out in big cities, but this nanakusa-gayu custom could be an exception -- it might be spreading from bigger cities to countryside now, at least in some parts of Japan. 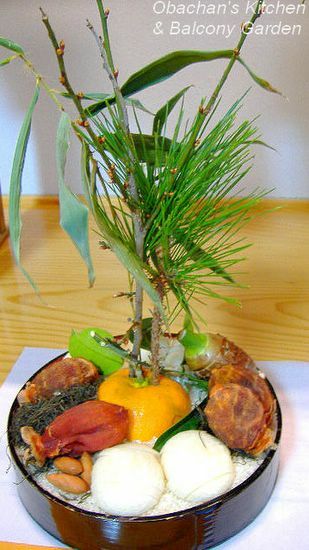 The reason is that to obtain the “official” seven-herbs for nanakusa-gayu at this time of the year, you need to be in an area with good distribution system. 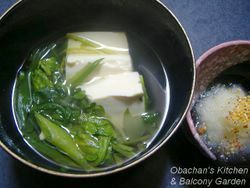 In many places in Japan, some of the seven-herbs are not available in the field at this time of the year, and the only way to get them is to buy a “nanakusa kit” at franchised big supermarkets. So if there’s no such supermarket in the area, there's no way to get the “official” ingredients. I guess that’s the reason why this custom is not observed in some very rural areas or the ingredients are substituted with whatever locally available. 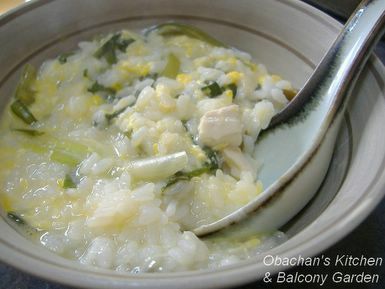 I may be wrong but from what I have read, this porridge-eating custom was imported from China, and in place of the herbs Chinese people were using at that time, our ancestors picked seven Japanese herbs for the ingredients. I assume the person who decided the “official” seven-herbs in Japan picked the ones available around the New Year's Day in old Chinese calendar in the particular area where he was living. In my hometown, my family has never made nanakusa-gayu, and I don't remember any of my elementary school classmates mentioning the porridge-eating custom. Teachers made us memorize the names of the seven herbs, but we had never seen most of them. In Kochi city where I live now, I saw the packed nanakusa herbs at a nearby supermarket, though I just didn't feel like buying them this year. 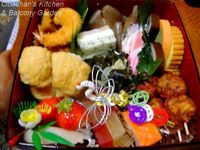 Perhaps, as franchised supermarkets and convenience stores become popular in rural areas, and as TV cooking shows feature nanakusa-gayu more often than before, the custom would be introduced to rural areas including my hometown. I might try making the nanakusa-gayu myself next year. 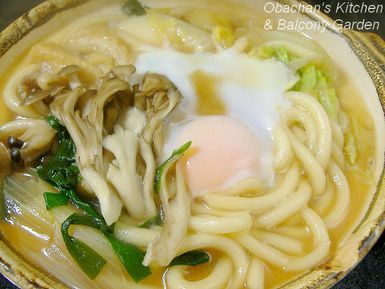 After all, it seems to be a good idea to rest our stomach with this kind of meal after a week of osechi-binging and sake-drinking. After the intensive osechi consuming period (??? 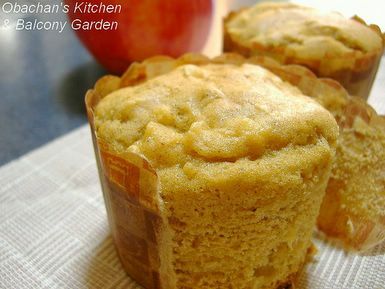 ), I craved sweet smell of apple, butter and cinnamon. So I made these for breakfast this morning. Yes, my first baking of 2006. Looks like dad forgot to add taro last year but this year he didn't forget to do so. 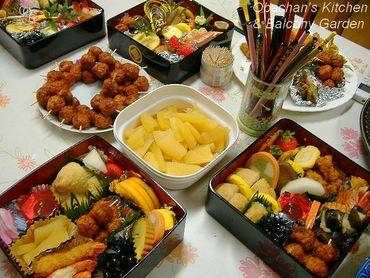 As I wrote last year, our osechi (traditional New Year dishes) is quite unorthodox as well as the decorations. Sorry, the food photos are a little blurred this year. It was not my or my new digital camera’s fault. My sister’s kids were so excited and they tried to hug me when I was taking shots and also tried to get their hands with peace signs in the food photos. The bigger one above is the only shot that survived without being blurred. We have to give the kids credit, though. Three of the below photos are the jubako (lacquer boxes) that they packed. * For more detailed explanation of osechi, see these sites. Since the ocean was rough and local fishermen couldn’t go fishing at the end of last year, no wild yellowtail was available. The sashimi was pretty good, though... except the extra-chewy squid sashimi. After the osechi, my niece prepared green tea for everyone (except my dad who was taking a nap). My mom teaches tea ceremony and looks like she gave my niece an intensive lesson a few days before the New Year’s Day. 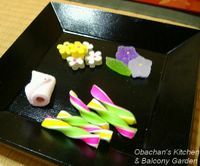 These are the wagashi we had: the photo on the left is higashi (dry-type wagashi) and the one on the right is namagashi (moist-type). So, we went through the necessary rituals again this year. It made all the family members really busy, but we know that we would have felt awfully sad and dull if we hadn’t done it (but once a year is definitely enough). I’m back! :D I left my parents’ house around noon yesterday, came back to my apartment in the afternoon, rested for a short while, and then went to work at the izakaya. Boy, I had a hell of a start this year!! Since most of the restaurants and drinking places were still closed, our izakaya was terribly crowded last night with the people who wanted to celebrate the 2nd day of the new year, though we… at least I… wasn’t ready for work at all. Of course not… In Japan, most companies are closed at least for the first 3 days of the year. We are supposed to pig out and goof off, watching New Year’s special shows on TV, at least for the first 3 days!! But I had to work like crazy last night. I broke 2 glasses and 1 big plate, and finally dropped a big heavy cast-iron griddle on my right shin. Now I have a big bruise there. Oh boy… I was feeling pretty miserable until I came back to my apartment after midnight and found so many nice comments/greetings waiting for me on my blog :D Yeah, they really saved the day. Thanks a million! 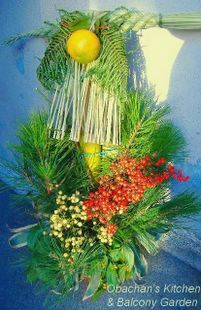 * Oh, I'm using a special new year's template for my another blog until Jan. 7th, if you are interested.